Editor’s Note: I had the opportunity to meet Rob Behr of Western Powders recently at the SHOT Show—a mammoth firearms industry trade confab held annually in Las Vegas. Western was there promoting its lines of handgun, shotgun and rifle powders. Western is not a big company compared to its competitors but think of them as the little engine that could. They have excellent products and a truly informative website with an online loading guide, a great blog and information on loads for popular firearms as well as some of the more esoteric ones. I don’t have a lot of personal experience with their rifle powders but their products come highly recommended by some very knowledgeable folks here in Hawaii. However I have used at least one of their handgun powders, Accurate #5, in my S&W model 27 (.357 magnum) and loved it. (So let me brag a little bit. By using #5 I was able to work up a load accurate enough to knock down 12” plates at distances of over 100 yards). Rob, who handles marketing (among other duties) for Western, is a very knowledgeable hand loader. In addition to managing the website, he writes the “Dear Labby” advice column for the company’s online magazine. Despite Rob’s self-deprecating manner, you’d be hard pressed to find a better authority on hand loading. I had a chance to interview him recently about the company and got some valuable tips on reloading to boot. This is the first of a two-part series. Q: Tell us a bit about the history of the company? Western Powders grew from a family owned business that specialized in the sale of explosives to become one of the largest distributors of gun powder in North America by the early 1970s. In 1998 Western Powders developed the Ramshot line of propellants and followed that with the purchase of Accurate Arms in 2005. Q: You’ve had quite an eclectic career. Tell us a little about yourself and how you ended up at Western Powders? This question made me laugh. Eclectic is such a nice word for a career that more truthfully could be called haphazard and desperate. When you graduate from college with no real skills, the world quickly reminds you that getting a degree in Political Science and History was not path that will lead to riches or even a consistently stocked refrigerator. So, you take work where you can find it. For the last couple of decades, I have made my living with guns, either carrying them as a police officer, making them with Cooper Firearms or working with propellants here with Western Powders. Before that I was a newspaper editor and a social worker. Basically, it seems I can’t hold a job. Q: How does Western differentiate itself from other manufacturers? Isn’t powder pretty much a commodity? 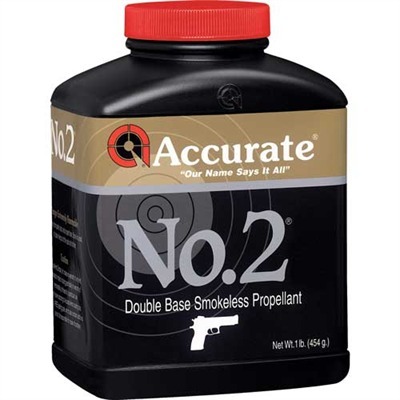 Accurate #2, a great .38 special powder, is now back on the shelves. One of the great handloading misconceptions is that we, or Hodgdon for that matter, actually make smokeless powder in our plants. All of the smokeless powder that is available for private handloaders is made by a few large propellant manufacturers. Companies like us contract with these large manufacturers to buy large lots of powder that have very specific burn rates and densities that are sold as canister-grade products. It is our selection of unique burn rates and specialized deterrents that set our powders apart from the competition. We have been good at filling niches with powders that are extremely well suited to the task. Our Accurate 1680 is a case in point. It has been a boon to small caliber wildcatters for years and is extremely well suited to the 300 Blackout because of its small grain size. Ramshot TAC is ideal for the .223 Remington and .308 and is extremely popular in 3-Gun competition. Our accuracy-oriented LT line of powders hold a handful of world records with less than five years in competition. As a company we look at specific areas of use and consider what it takes to provide an ideal propellant for that shooter’s needs. From there we set criteria for the propellant and then sit down with the engineers who will make the powder into a reality. For us, it isn’t a shotgun approach to the marketplace, it is much more a sniper’s bullet. Q: There still seems to be a powder shortage, at least from my vantage point. Do you see that changing in the near future? For years the production capability of smokeless powder manufacturers around the world was in rough balance with demand. There was very little surplus production available, especially for canister grade propellants which make up a very small part of total market. When Obama came into office, demand for firearms, components and powder soared in the American market. The producers had a choice: they could expand the size of their plants at great cost while betting that the market surge would last, or treat the uptick in the American market as a temporary bubble. Most chose to wait. Saint Marks Powder chose to accept the risk and increased their production capacity at great cost. 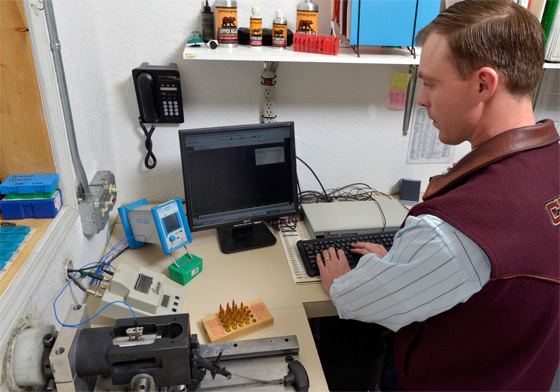 They have been a beacon for the American handloading public and are largely responsible for the increased availability of powders handloaders are seeing back on store shelves. Increases in their production capabilities have allowed harder to manufacture powders like our Accurate #2 to find places in production runs and finally get it back on the shelves. Currently, things are looking good for supplies of canister grade products. If things remain on this course, store shelves should begin to look like they did in 2007 in the near future. The real wildcards are the Presidential race and international affairs. The shortages will continue and intensify if the democrats continue to hold the White House after 2016. Hillary Clinton is no friend to gun-owners and they know it. Her election would spark another round of panic buying for fear the products will no longer be available. Beyond American politics, the world became less stable as Obama led an American retreat from the world stage. Russia is threatening NATO as aggressively as it did in the Cold War and China is flexing its muscle in the Pacific. War between world powers would result in powder shortages unlike anything seen by the consumer market since World War II. Western does extensive load development in their state of the art lab. Q: Let’s get specific about Western powders. What would be your choice of your products for handgun-centric loaders. What would your choices be for 9mm through .40 (including 38 special)? What about .45 acp? Any suggestions for magnum loads? My personal choice for hand loading is to use the slowest powder that will bring the cartridge to SAAMI maximum average pressure. This combination typically provides the best velocity with the lowest pressure. Gas volume drives bullets and more powder equals more gas. There are times when faster powders provide unique answers, especially in the .45 ACP, but generally I prefer the slowest option available. Handloaders sometimes overlook powder speed when they are pursuing performance and the result is higher-than-necessary pressure to produce a given velocity. I did a story comparing 9mm Para +P loads using our Ramshot Competition shotgun powder and Accurate #7 in an Uzi and a Ruger SR9. The results highlight pressure and powder choice as it relates to performance. With the #7, the Uzi ran like a Swiss watch and produced more than 1,450 fps. The SR9 did a bit over 1,200. With the same pressure Competition loads the numbers were 400 fps lower for the Uzi and 250 fps slower for the SR9. The Uzi wouldn’t even cycle. In the case of very fast powders, +P pressures truly do add pressure but the velocity increase does not follow the pressure curve. For the 9mm Parabellum I really like Accurate #5, Accurate #7 and Ramshot True Blue. True Blue is my favorite for production loading because the powder grain is so small it flows like water from a mechanical thrower. The powder stacks very efficiently in the case and allows for heavier powder charges in small capacity cases like the 9mm Para and the .380. Accurate #7 is an especially good choice in 9mm carbines. The .40 Smith and Wesson is one of my least favorite cartridges to reload. If you are using range brass, or you have a pistol with a generous chamber (Yes, first generation Glock 22 owners, I am talking about you and a handful of other mono-block polymer pistols) buying one of the Redding G-Rx dies is a very good idea. It is a push-through die that irons out case bulges right above the web where a regular sizing die will not reach. This bulge is caused when the cartridge is unsupported because of the undercut feed ramp. I have also had .40 brass that did not want to resize down far enough to grip the bullet using standard dies. I finally went over to an undersized full-length sizing die made by Lee, which overcame the brass memory problem. Accurate #5, #7 and True Blue (among others) work well for 9mm, 357 Sig and .40 S&W. 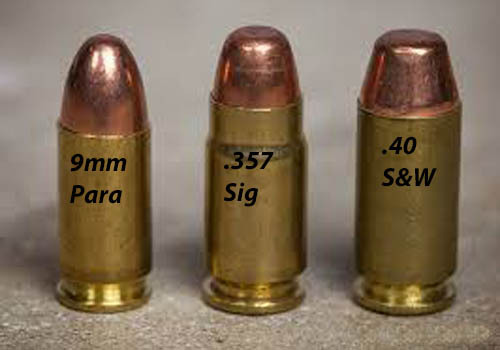 The .40 S&W operates at the same pressure as a 9mm Para, and for that matter the .357 Magnum as well, but the larger case diameter results in less hoop strength than either of these other cartridges. Accurate #7 is the best choice here, with its ability to produce velocity with less pressure. Accurate #5 is my second choice with the .40 S&W followed by True Blue. The .38 Special is a fun case to reload, but its very low pressure standard can make it dangerous if the loader isn’t paying attention. Very fast pistol powder with very low charge weights are the norm with the .38. This formula has worked for more than a century and in terms of performance the .38 is still chugging right along. The real danger, and this is one that exists with all voluminous cartridges that were designed with black powder in mind, is the risk of double or triple charging a case without noticing. The best rule of thumb is to load above 50% capacity so that a double charge overflows the case or at least is noticeable fuller than it should be. The .38 is one of those that makes this rule difficult, so make sure to check each case fill individually if possible. Low density loadings in the .38 Special will tend to have higher standard deviations because of powder orientation changes as the grains move within the case. Small charges of powder that are allowed to migrate within a large cartridge usually present three distinct and reproducible pressures caused by powder orientation inside the cartridge. The lowest pressures are created when the powder is oriented against the bullet. The highest pressures occur when the powder rides directly above the primer. A middle pressure range results from the powder lying on along the bottom of the case like water in tipped over drum. Here is a shorter take on this long, dull paragraph: The .38 Special needs powders with lower bulk densities. Accurate #2 is the best choice in the .38 Special. It is a spherical powder with very low bulk density — a fancy term for fluffier — and fills the case more completely limiting pressure changes caused by powder migration. Accurate #5 works well in 45 ACP. I love #5 in 357 magnum. The .45 ACP is another fun and easy cartridge for the handloader. It has limited capacity and a low operating pressure, two real pluses if you are looking for a versatile cartridge in terms of good powders. It is at home with all but the slowest pistol powders. 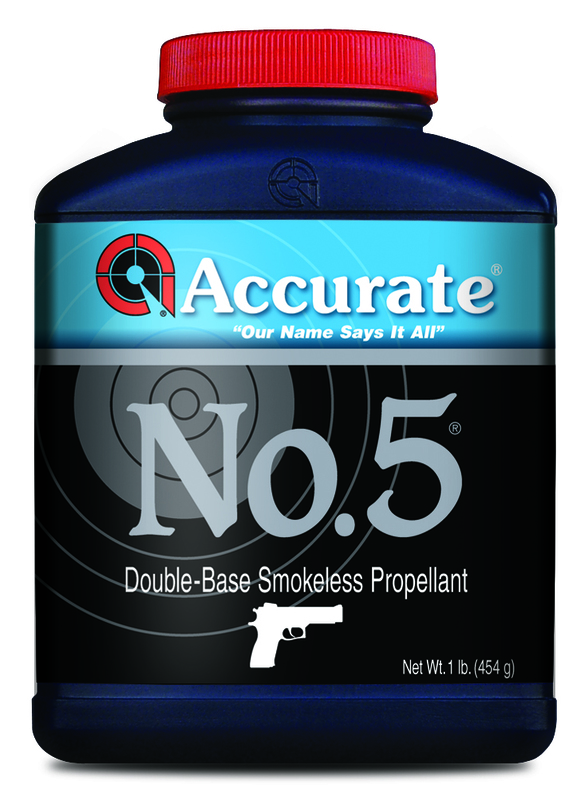 True Blue and Accurate #5 are my favorite choices, but I have used all of our powders to load the .45 except for Accurate #9 and Accurate 4100. All of the powders produced very good accuracy. My best luck with the .357 Magnum has been with Accurate #9. I’ve used A4100 as well but it is not a versatile with lighter bullets. The .44 Magnum is an interesting cartridge. It can be ferocious and flash bright enough to signal the space shuttle if that is the shooters choice, or it can be a manageable, accurate cartridge for casual shooting. People almost never want it for the latter option. If you are looking to impress your date or set a grizzly bear on fire it is pretty hard to beat Accurate 5744 with very heavy bullets. Both #9 and Accurate 4100 offer lower spectacle high performance loadings. If you want to run the accurate and pleasant .44 Special in your .44, Accurate #2 is the best powder, hands down. Rob Kay writes about firearms for All Outdoor Tech and is the author of How to Buy an AK-47.